In fact, Bret felt so strongly about the raw, pure emotion in the original demo (engineered on a laptop on his tour bus by longtime friend and music director Pete Evick), that after spending a lot of time trying to recapture it in a multi-million dollar studio, Michaels decided to release the original demo. Erick states, “More times than not, Bret’s original untouched ideas are the best stuff. It’s amazing watching him work. Bret will beat-box, hum, or sing all the parts from the drums, bass, guitar, keys, and even horns, right down to the vocals. Then go back and do the tracks with the instruments. He pushes my knowledge and the technology as far as it can go. The most special thing about this track is that Bret plays everything himself: all guitars, other instruments, and vocals (except the female harmony) are 100% him”. This is the first single from Michaels since his modern country crossover Girls on Bars, co-written by two-time CMA award winner Luke Laired. Laired said, “Bret is awesome to write with. Ideas just kept coming nonstop when we were in the studio. He’s always ready and willing to push the boundaries and try new things”. “Girls on Bars” boasted the highest number of views of any debut single ever on CMT. The highly-anticipated new single Jorja Bleu which in many ways is the sequel to his song Raine which is titled after his oldest daughter drops on Tuesday April 7th on iTunes and all other digital retailers and subscription audio formats. Michaels, who has been described as a “Cultural Touchdown” by former CEO of MTV Judy McGrath (currently on the board of directors at Amazon) has had cross-genre and multi-generational success with songs like the country hit All I Ever Needed and the pop duet Nothing to Lose with Miley Cyrus; the latter was the most added song to radio the week of its release, topping both Bon Jovi and Nickelback. Catch Bret out on the road with Poison along with Def Leppard and Tesla. Poison have also announced their own select headlining dates, click here to view their itinerary. 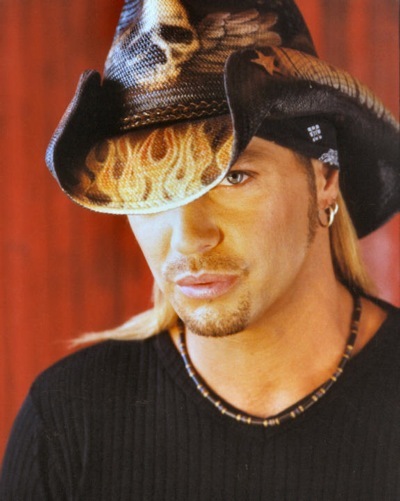 Bret Michaels is an immensely talented guy! I think a lot of people sort of dismiss him because of his being a part of POISON, because they identify POISON with the whole “hair metal” thing. But if you really look at his whole body of work, you will see that he can write hard rock, country, or pop tunes really well. And, of course, he can sing the hell out of them! I always liked POISON, because they wrote really catchy songs. They weren’t “deep” of course (with a few exceptions), but they were catchy and stuck in your head. To me, that is always a sign of a good songwriter. Bret is a really good singer, songwriter, and frontman! I agree with you, Keith. Hmmm….Poison is touring with Leppard and Tesla this summer. Wouldn’t it have been more appropriate to release new Poison music with the upcoming tour? Or has Poison simply become a nostalgia act paying tribute to themselves? Totally agree, Rattlehead! What’s the point of touring without something new to promote? I would to have some new POISON music! Come on, guys! Please no more new Poison music,lol. If Doug R. were here, he’s say give us ‘something to believe in’.